How would you think, if I would have told you about the origin of the mankind species? Scientifically there are so many opinions, documented texts and theories. But how many of you are aware of the origin of the mankind considering the popular Indian (Hindu) mythology? Have you ever heard of the mythical Indian Sage Manu? I believe hardly handful of you must be familiar with the legendary Saint who was mentioned in ancient Indian texts of the Puranas and the epics of the Ramayana and Mahabharata. In our country, mankind is popularly known as “Manava, Manus”. The origin of these words “Manava or Manus” are linked with the sage Manu. Well for knowing the rest of the story all of you have to travel with me to old Manali, in the state of Himachal Pradesh, India. 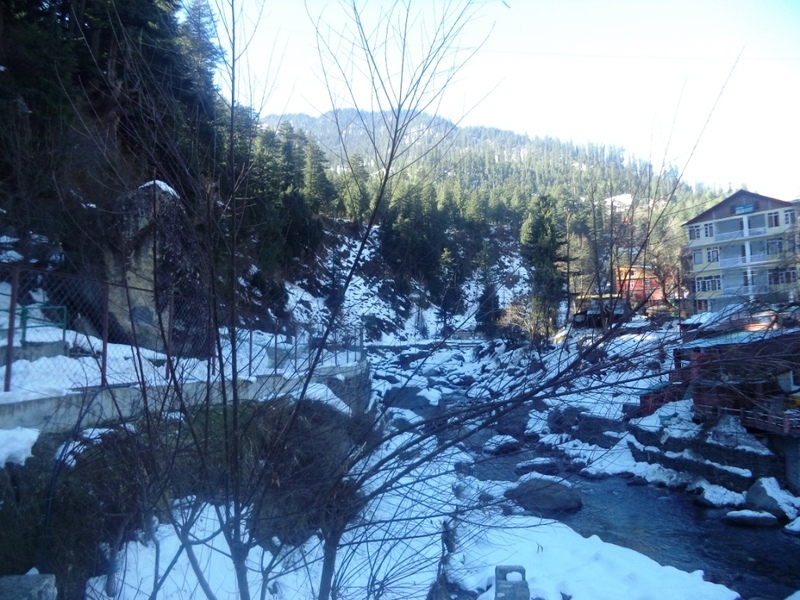 Our trip to Manali was planned during the Christmas, last year. It was snow and snow everywhere. The roads had been cleared just a couple of days back. 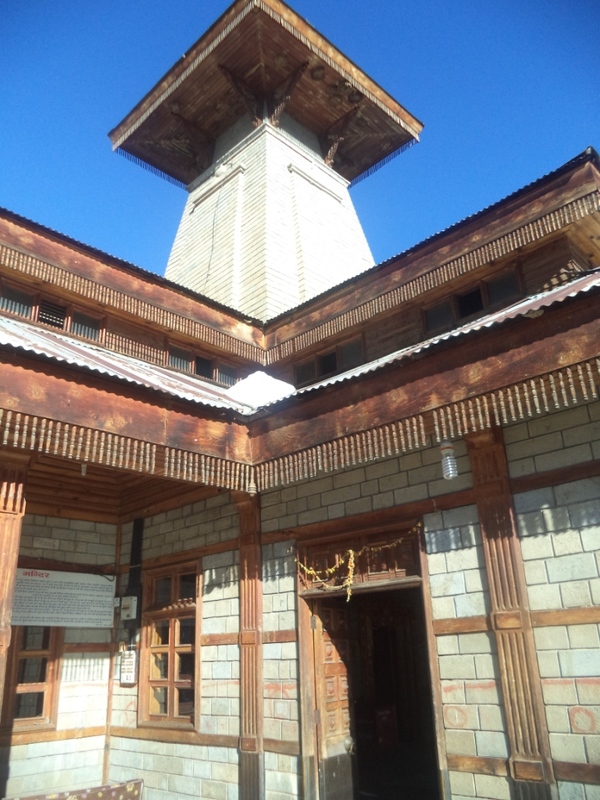 The civic authorities had just officially allowed the influx of the tourists after the previous week’s “Manali Shut Down” that took the headlines of most Indian National Dailies. Well that’s not our story today. We had our bookings in a private hotel located near to the circuit house. For the local sight-seeing we booked an auto rickshaw from the stand located near the Mall road of Manali. 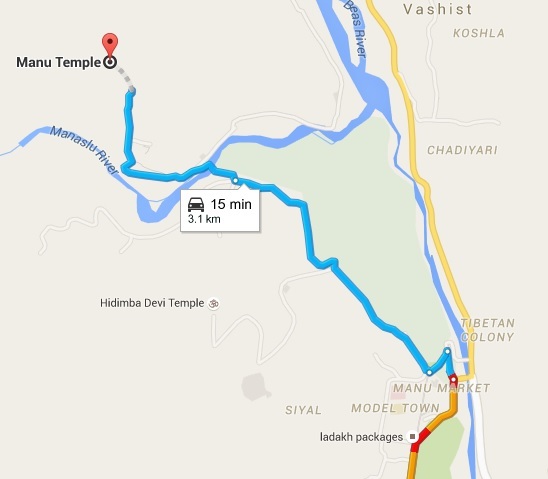 Our auto took us through the circuit house road towards the Manaslu River after crossing the Hadimba Temple road turn on our left. The Manaslu River Bridge was in awful slippery state with snow cover. It was very difficult for a light vehicle like that of an auto rickshaw to maintain its balance. We had to get down and carefully stroll to the other side of the river. We were thrilled to see that the river was almost in a frozen state and a narrow stream of water flowed through the snow capped rocks like a wild brook. 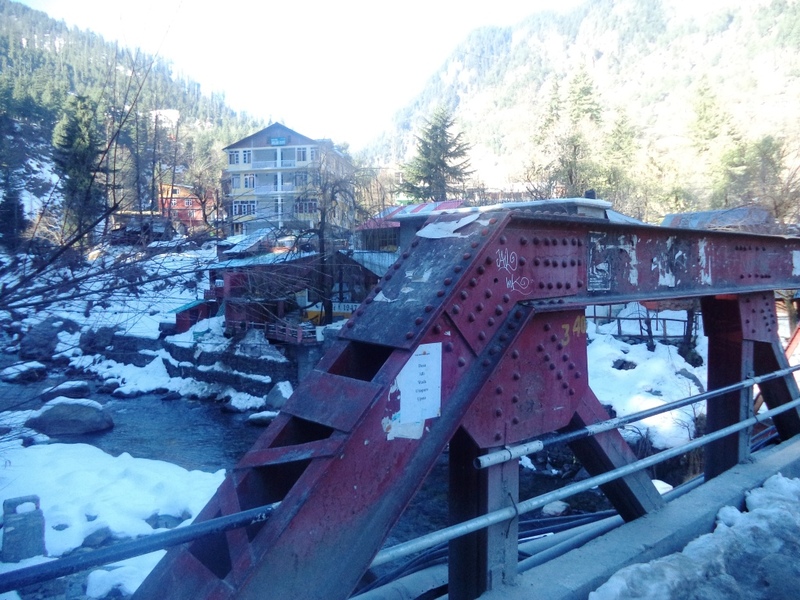 Once you cross the Manslu river bridge and step onto the other side you put yourself up into the Old Manali. 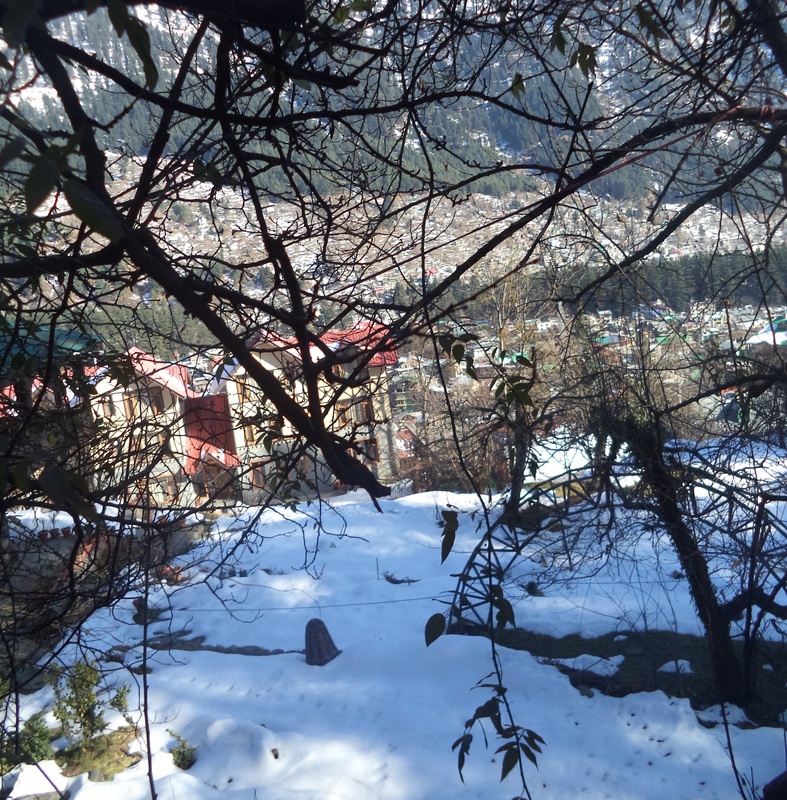 You can distinctively find the difference between this part of the town from the hues and cries of the new Manali which is always buzzing with tourist activity. Inspite of having clear blue skies it was cold like anything here. The bite of the chilled winds was too much to bear. 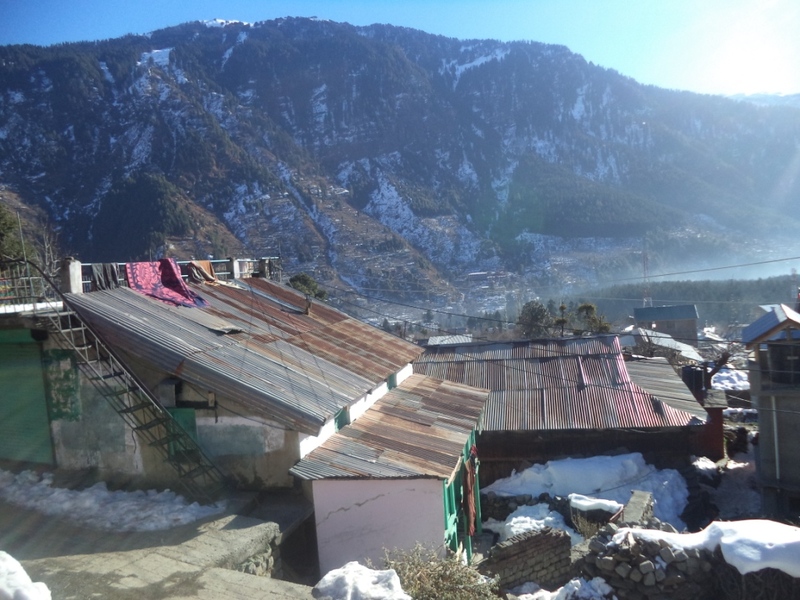 As we were climbing up through the narrow lanes the mansions around us gradually grew fewer and fewer suddenly leading us to a village with stone tiled huts, distant woods and cattles grazing in open snow capped grounds. 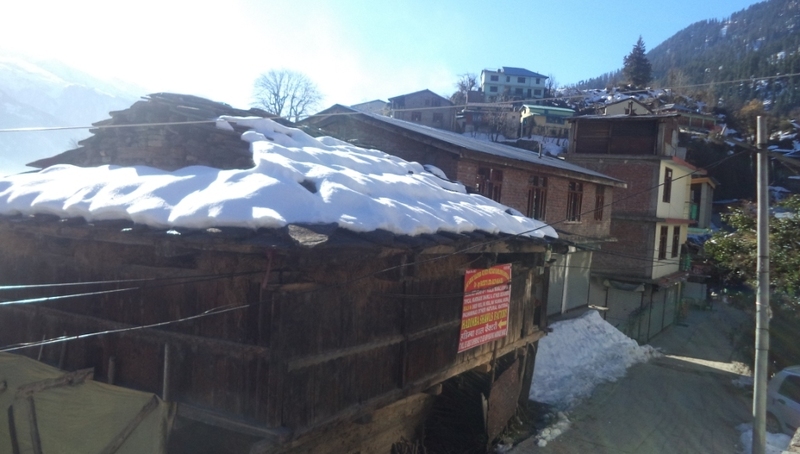 This was the beauty of Old Manali. 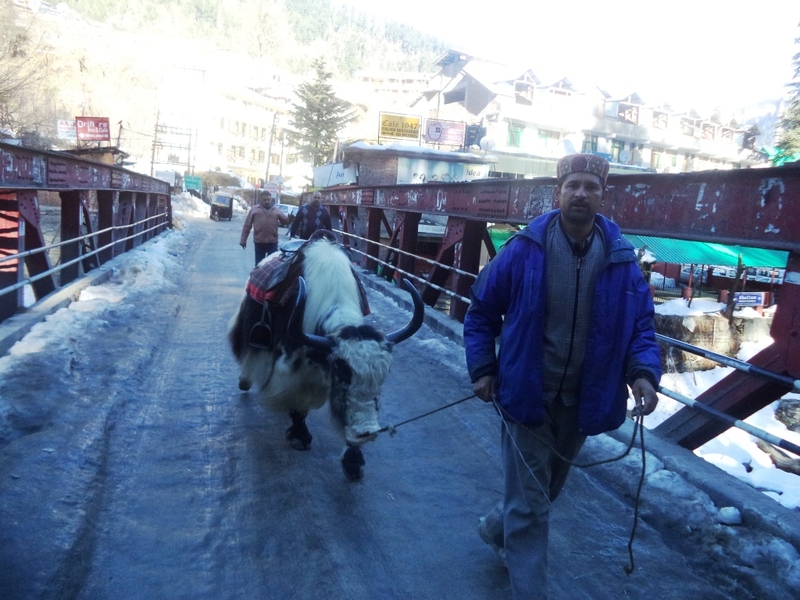 The dress code and the etiquette of the local people gathered near to a grocery shop were altogether different from the busy people you may see at Manali. There was a calm and peaceful aura everywhere. We hardly found anybody around us. 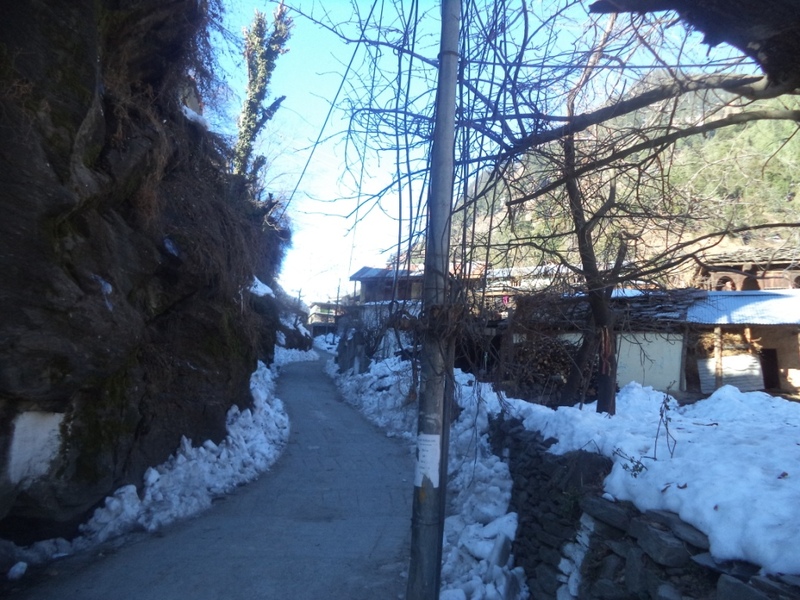 With the narrow road getting narrower and so much snow on it, it was impossible for our autowala to motor the vehicle up. We were forced to get down and manage our balance in the slippery way up. 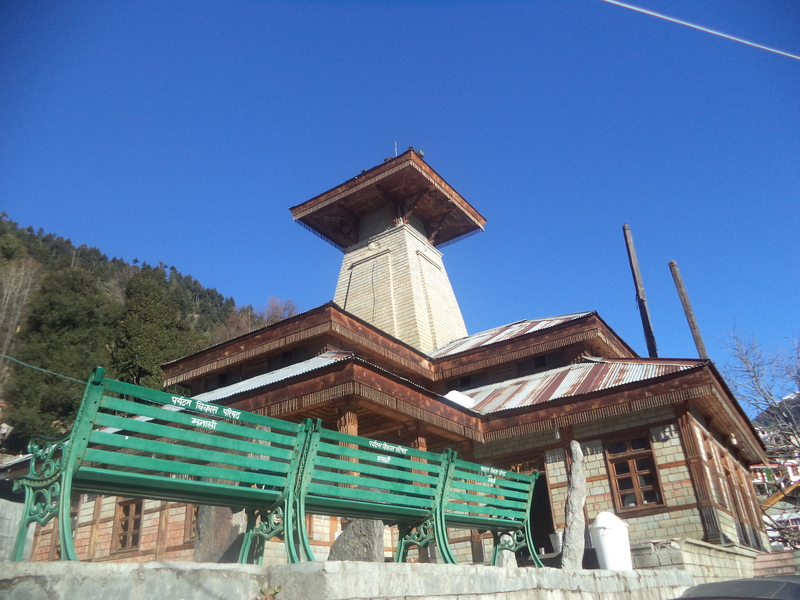 We took a right turn to find the Manu Temple which looked beautiful in the backdrop of clear blue skies and the pine woods. Legend says that when the known world was consumed by the oceans, it was the sage Manu who had rescued all species of animals and plants in a gigantic vessel to escape the wrath of the consuming oceans. His vessel was about to capsize when Lord Vishnu took the Machanider (Matsya) avatar of a Giant Fish to rescue Manu’s vessel. After the end of the catastrophe the vessel was carried to a mountain valley, where sage Manu and the living beings of his vessel took refuge. This place was known as Manu Alaya (Manu’s house). With the receding flood, sage Manu under Divine influence regenerated mankind and the known world from extinction. 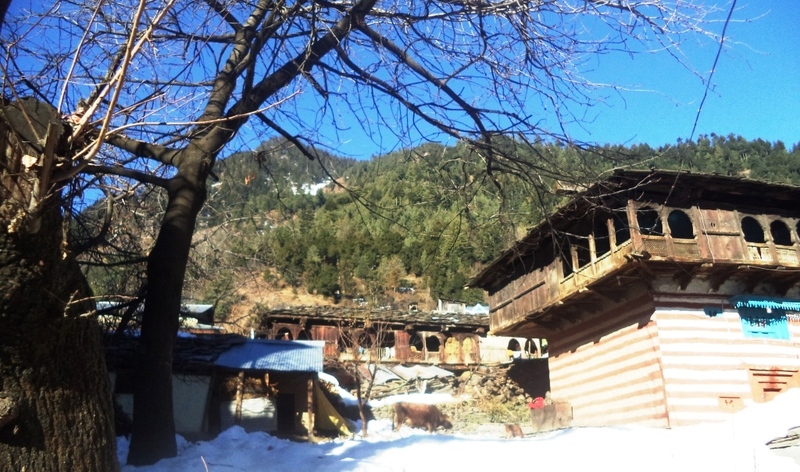 Call it folklore or popular myth, whatever it was, “Manu Alaya” was perhaps the beginning of Manali. 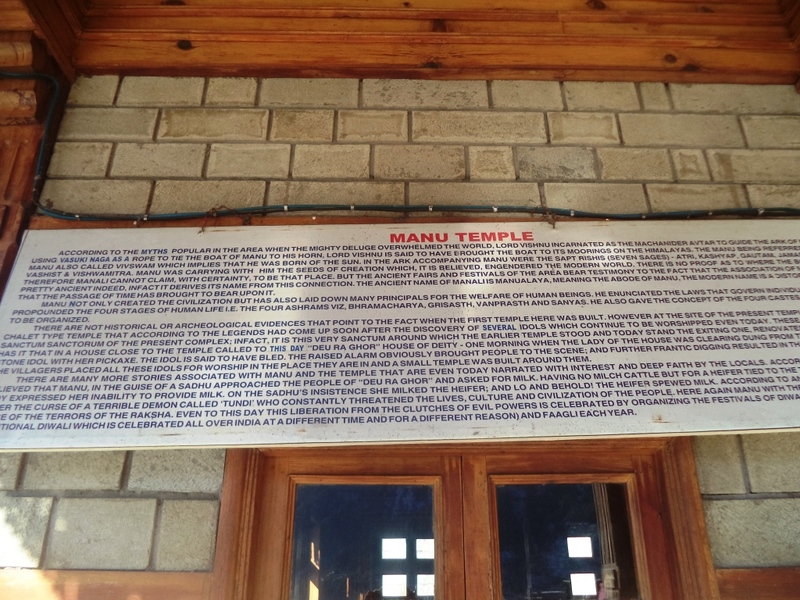 Now whether it was sage Manu who had built this temple or his disciples had done – it is not known for sure. There are hardly any archaeological or historical evidence behind this long story I have shared with you. But whatever was the real story, you will find absolute peace of mind in this temple. There was an aura of silence that thrilled us. We offered our prayers at the temple sanctum and were happy to visit this amazing place. After listening to the story of our mighty sage Manu, many of you might say – the story looks so similar to the legend of the ark of Noah who had also been the progenitor of the known world from the ghastly deluge of the oceans. Now a debate may arise whether the great sage Manu and Noah were the same person or different people altogether – that has to be explored and put on to papers. Well that’s the job of our historians and experts among you readers. We came down to the auto rickshaw parked a few yards down the Manu Temple, with the Hadimba Temple as our next destination.